Recently an online book company had a Mega Sale... I ordered Me' a Kai ~ The Food and Flavours of South Pacific... since I can't experience the first two ~ the wave and the swim!!.... I could still have a taste of South Pacific... may be that will make him change his mind !!!! Palumalau Sosi Pe'epe'e that's what it is called in Samoa... a whole roasted fish in coconut sauce. Rub the fish with some salt and lemon juice. Put it aside. Mix coconut milk, lemongrass, garlic, ginger, lime leaves, coriander and garam masala and fish sauce into a blender. Blend well. Cut 3 or 4 diagonal slashes on each side of the fish. Rub the coconut spice mix all over the fish and inside the gut cavity. Cover with plastic wrap and refrigerate for an hour. 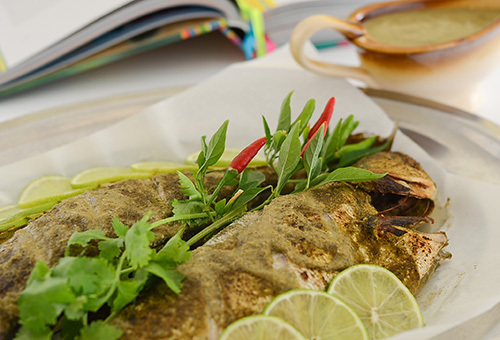 Remove the plastic wrap and bake for 30-35 minutes or until the fish is cook (the eyes goes opaque and flesh pulls away easily from the bone). Leave it to cool for 15 minutes. Carefully lift the fish to another platter, drizzle some of the coconut sauce over the fish and pour the remaning sauce into the gravy boat. 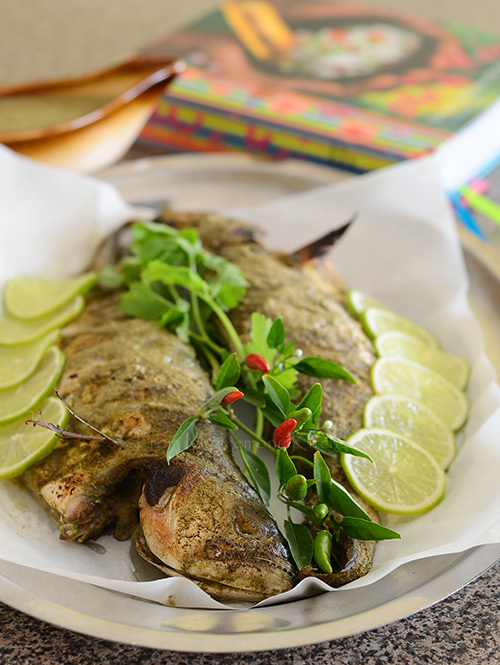 Garnish the fish with lime wedges, lime slices and fresh coriander. Looks Delicious with coconut sauce.. 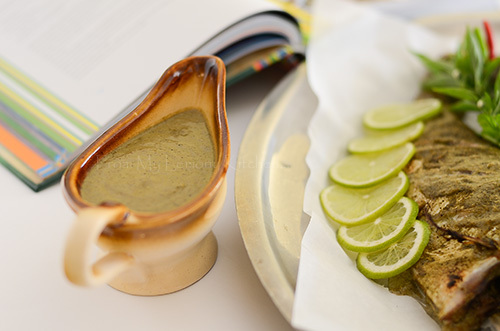 wow...I'm drooling overe these pics...what a lovely fish recipe ! Very delicious! I love the use of coconut in fish. A good dish and a lovely dream. Wish you and your family are flying soon : ).